W0767: Plaza A Construction started on Plaza A in about 250AD and it eventually replaced the first ceremonial centre which lies further west. The Maya of Altun Ha practised the archetypal Mesoamerican principle of building their ceremonial structures around large square plazas.In total they built 8 structures around Plaza A, with an approximate north-south alignment. Figure W0767 looks west from Structure B-1, which is not much more than a mound and runs into a similar mound called Structure A-4. Structure A-4 sits in the west corner of the southern flank and was a simple platform possibly designed to close Plaza A off from Plaza B. 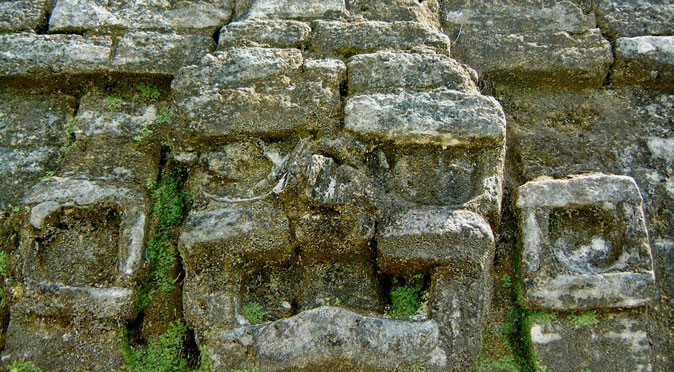 The larger structure that A-4 leads into along the southern flank is a temple known as Structure A-3 (you can see the side of Structure A-3 in figure W0767 above). W0762: Structure A3Structure A-3 (fig. W0762) is the smallest temple structure in Plaza A. Structure A-3 was first developed in 400AD and shows signs of continuous development through to the 9th century. 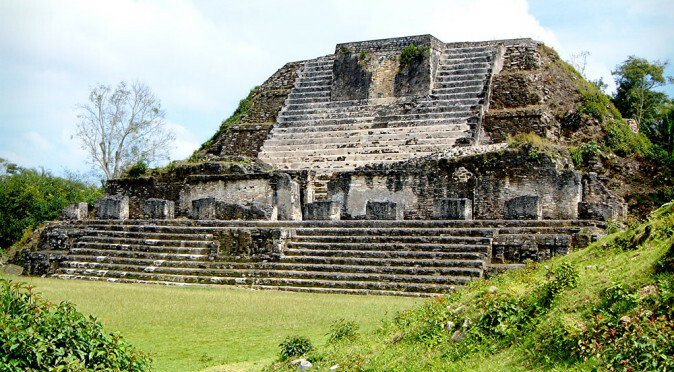 At first glance it appears to be a typical Mayan Temple, with a large central stairway and enclosure on top. 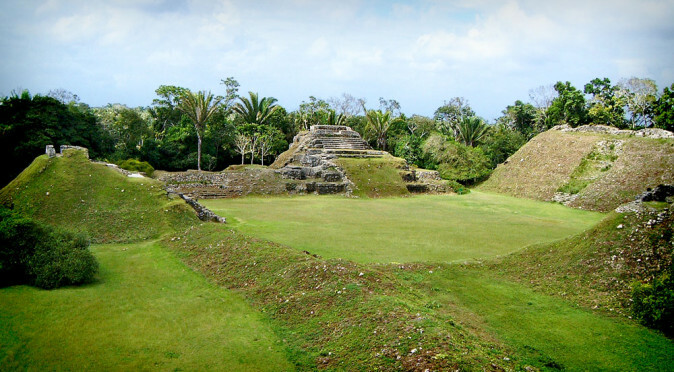 However, it is actually formed with three terraces in a style more familiar to that of Lamanai. A limestone altar was found here which depicts the king sitting on his throne with his arms crossed and another man kneeled at his feet. The next building around Plaza A is Structure A-2, which is planted directly in front of Structure A-8. Structure A-8 was the earlier structure and is thought to have been a Palace or Great Hall. Early on, Structure A-8 featured four large rooms and faced east on to the Plaza. However, later on, the rooms were subdivided and the entrance was moved to the south. At this point, a platform was added to run along the former entrance from Structure A-1, and this platform is Structure A-2. It seems likely that Structure A-8 started as a Great Hall or meeting house, but was later converted into a residential dwelling or palace. Next along the western flank is Structure A1, which is by far the most important of all the structure in Plaza A and is dominates the ruined remains that line the plaza (it is the largely intact building on the far side of the plaza in W0767) . W0761: Structure A-1Like Temple A-3, Structure A-1 is an unusual hybrid of the Classic Mayan style and the more unusual style of nearby Lamanai. Temple A-1 rises with three even tiers, with the third creating a large terrace that housed a temple enclosure. Behind the temple, the pyramidal base continues to rise to a second temple which sits on top. The stairway at the front was allowed to fall into disrepair whilst the temple was still in use. This is because access to the top of Structure A-1 was provided by the addition of a second stairway at the side which led up from Structure A-8 and A-2. This development would have probably coincided with the development of Structure A-8 and the addition of Structure A-2. The result was that the elite could access the temple enclosures on Structure A-1 from the palace Structure A-8 without needing to descend in Plaza A. This development may also have coincided with Temple A-1 becoming a sacred mortuary temple. For inside Structure A-1 is the “Green Tomb”, which contained a 6th century male burial and over 300 jade objects. 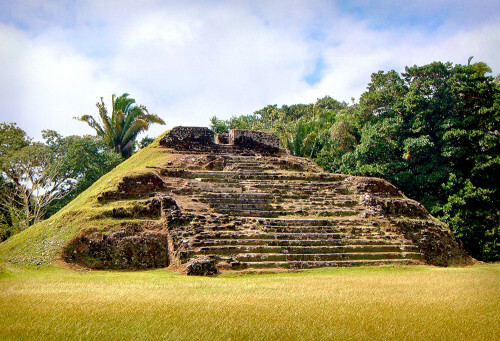 The male, who was almost certainly a ruler of Altun Ha, was buried in approximately 550AD and along with the copious number of jade artefacts, he was also buried with shell necklaces, ceremonial flint objects, pottery, hides, stingray spines (that he would have used for sacrificial blood-letting), and a form of bark-book known as a codex. The codex was sadly too damaged to reconstruct or read, but it does provide evidence that codices were being produced at this early stage at Altun Ha, and that such books were used as burial goods. 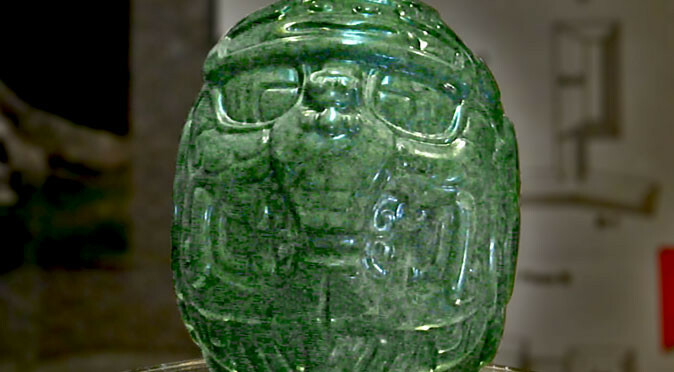 Jade objects found in this number are also of great interest; not only does it emphasise the wealth of Altun Ha, but it also evidences a strong trading tie with Copan to the south, where the majority of jade was mined and exported. The Plaza as it appears today is principally the work of the 6th century. During this period the buildings were raised to their present levels and the plaza was closed on all four sides. Structure A-6, which lines the entire northern side, was built in two stages during this century and it is by far the largest structure in the group. No stelae were found in Plaza A, which is unusual as these would normally be erected to commemorate great rulers and significant events – especially in front of mortuary temples such as A-1. Their absence perhaps suggests they were moved, destroyed or buried at some point. 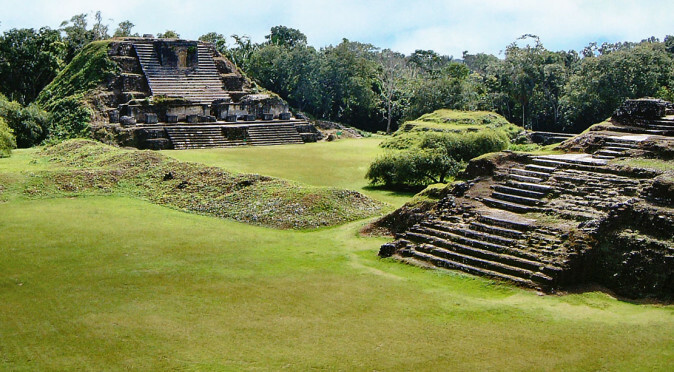 However, tie the absence of stelae together with the closure of Temple A-1’s stairway and the complete enclosure of Plaza A on all sides, then we could infer that Plaza A was considered unsafe by Altun Ha’s royalty. 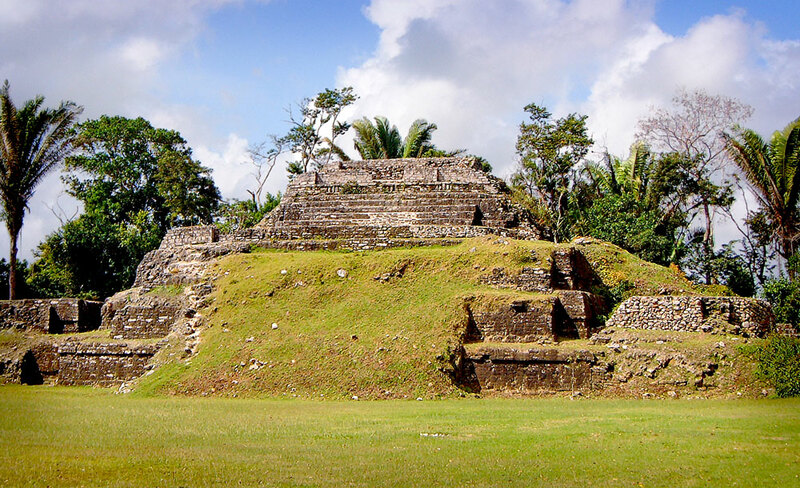 This in turn suggests that a large number of Altun Ha’s citizens may have been slaves or impoverished labourers that were deeply unsatisfied with the ruling elite’s wealth.